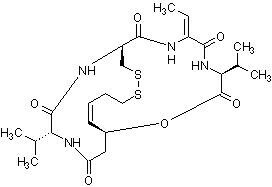 Potent HDAC1 and HDAC2 inhibitor (IC50 values are 36 and 47 nM at HDAC1 and HDAC2 respectively). Induces apoptosis, cell-cycle arrest and modulates cytokine expression in cancer cells. Antitumor agent. Active in vivo and in vitro. Shipped at 4°C. Store at -20°C. It is important to note that this product is reported to be light sensitive. Store In the Dark. Store under desiccating conditions. Publishing research using ab143287? Please let us know so that we can cite the reference in this datasheet. There are currently no Customer reviews or Questions for ab143287.